Age 57, passed away on Wednesday, February 5, 2014 after a courageous battle with cancer. Otha was born July 1, 1956 in Ailey, Georgia and raised on a farm near Vidalia, Georgia to Frankie Graham (died in 1968) and Louise Wells. Louise later married Bobby Blount. Otha was the oldest of 8 children. On July 1, 1983 he was united in marriage with Sarah Grubbs. 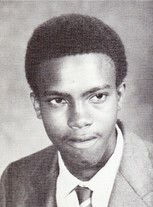 Otha graduated from Lyons Senior High School in 1974 and Savannah State University in 1978. After college Otha started working at AT&T in Winston-Salem, North Carolina. It is in North Carolina where he and Sarah began their family with the birth of a daughter, Alytha Jenée. He eventually transferred from North Carolina to Bolingbrook, Illinois (1992) where he, Sarah, and Jenée put down their own roots. Otha worked at AT&T/Lucent Technology for 30+ years as project manager until his retirement in 2010.